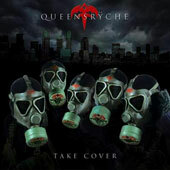 After the release of the excellent live-recorded Mindcrime At The Moore DVD, QUEENSRYCHE decided to produce an album full of cover songs to honor their artistic influences. So far so good, you might be thinking, but please hold your horses until you have read the following lines to see why this album did not meet my expectations. First of all if you look up to the tracklist then you'll realize that the band from Seattle chose songs that were originally released by some non-metal bands like Peter Gabriel or THE O'JAYS. On the other hand, one may think that this looks like the perfect chance to Metal-ize this songs by bringing them closer the sound of QUEENSRYCHE. Let me comment the tracks one by one and see what happens. The album opens with the cover on PINK FLOYD's Welcome To The Machine; here the American band creates an excellent atmosphere that is close to the original version. The addition of saxophone really spice things up and raise the listener's expectations for what's next. Unfortunately, Heaven On Their Minds is next that originally belongs to the Broadway musical Jesus Christ Superstar. Even though I haven't heard the original version, I found it rather boring with an annoyingly 'happy' atmosphere all over. The only 'plus' thing I could find here was the excellent guitar solo near the end of the song. The next cover is actually the only genuine Metal song of the album and that is Neon Knights from the well-known band from Birmingham. Here QUEENSRYCHE performs the song without any surprises; Tate fails completely to capture Dio's feeling to the degree that he sounds almost out of tune. After the last two tracks I had completely lost my appetite for the rest of the album; POLICE's Synchronicity II or Peter Gambriel's melodic Red Rain did nothing to take away the bitter taste from my mouth. On the contrary, things became even darker with Odissea where Tate sings in Italian and does an awful job! The last cover is on U2's Bullet The Blue Sky that was recorded live and can be characterized as a good one compared to the previous work. Hell, I think it would be best if I hadn't been assigned with this review, because my rating on this does not fit the QUEENSRYCHE moniker on top!